Once you have checked your FASTQ files and have removed all adapter sequences that might be present, you are ready to map them to a reference genome. While tools like BLAST and BLAT are powerful methods, they are not specialized for the vast amount of data generated by next-generation sequencers. It is highly recommended that you use a next-gen specific read alignment program. Do you have a favorite genome in the lab that already has a bunch of experiments mapped to it? Use that one. Do any of your collaborators have a favorite genome/version? Download FASTA files for the unmasked genome of interest if you haven't already (i.e. from UCSC). Do NOT use masked sequences. I also tend to remove the "*_random.fa" chromosomes. These often contain part of the canonical chromosomes in addition to regions that cannot be placed in the assembly. The problem with these regions is that the part shared with the canonical chromosome will be present twice, making it difficult to map the reads to a unique location. This command will create 6 files with a *.bt2 file extension. These will then be used by bowtie2 or newer versions of tophat to map data. The most common output format for high-throughput sequencing is FASTQ format, which contains information about the sequence (A,C,G,Ts) and quality information which describes how certain the sequencer is of the base calls that were made. In the case of Illumina sequencing, the output is usually a "s_1_sequence.txt" file. More recently the Illumina pipeline will output a file that is debarcoded with your sample name such as "Experiment1.fastq". In addition, much of the data available in the SRA, the primary archive of high-throughput sequencing data, is in this format. Where <genome index prefix> is the common prefix for the *.bt2 files that were created using the bowtie2-build command in step 1, or from a downloaded index. If the *.bt2 files are stored int the "/path-to-bowtie2-program/indexes/" directory, you only need to specify the name of the index. If the index files are located elsewhere, you can specify the full path names of the index files (in the examples above this would be "-x /programs/indexes/hg19"). In the example above, we use 8 processors/threads. The bowtie2 program is very parallel in nature, with near linear speed up with additional processors. The default output is a SAM file. To learn more about SAM alignment files, go to the next section on SAM/BAM files. There are many other options for bowtie2 that may be important for your study, but most ChIP-Seq data can be mapped using the default options. NOTE: Usually, the process of removing duplicate reads or removing non-unique alignments is handled by the downstream analysis program. STAR is one of a growing number of short read aligners that takes advantage of advances in computational power to optimize the short read mapping process (original publication: Dobin et al.) The key limitation with STAR is computer RAM - STAR requires at least 30 Gb to align to the human or mouse genomes. To install STAR, visit the website and follow their instructions. 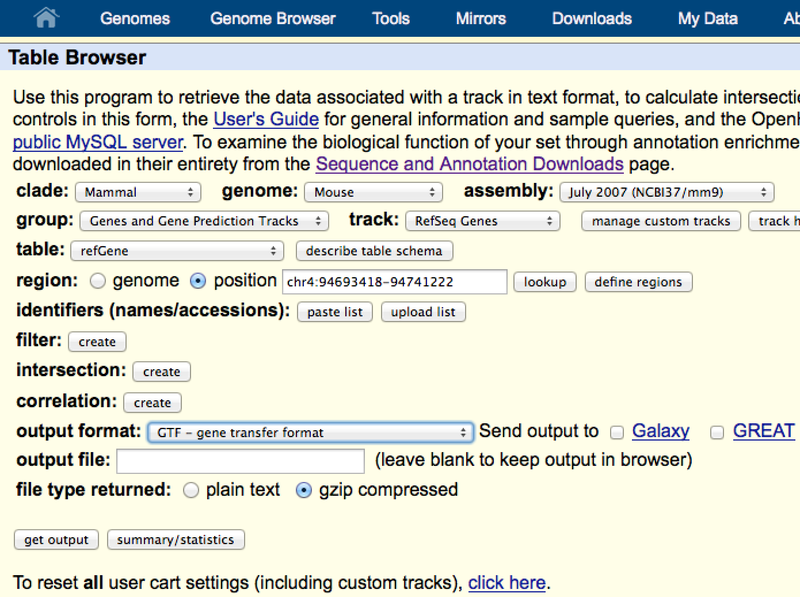 Note: For small genomes, you may need to add the following to create a proper index: "--genomeSAindexNbases 6"
STAR will create several output files - the most important of which is the "*.Aligned.out.sam" - you will likely want to convert this to a bam file and sort it to use it with other programs. The default output is a SAM file. To learn more about SAM alignment files, go to the next section on SAM/BAM files. STAR is very very fast - it will rip through 20 million reads in a matter of minutes if you have 20 cpus working for you. In fact, the longest part of the program is loading the index into memory. If you are aligning several experiments in a row, add the option "--genomeLoad LoadAndKeep" and STAR will load the genome index into shared memory so that it can use it for the next time you run the program. Also, converting the sam file into a sorted bam file will take much longer than aligning the data in the first place. Tophat is basically a specialized wrapper for bowtie2 - it manipulates your reads and aligns them with bowtie2 in order to identify novel splice junctions. It can also use given splice junctions/gene models to map your data across known splice junctions. This part is exactly the same as for bowtie2 - if you already made or downloaded an index for bowtie2, you can skip this step. In the example above, we use 8 processors/threads. The tophat2 program contains a mix of serial and parallel routines, so more processors doesn't necessarily mean it will be finished much faster. In particular, if you are performing coverage based searchers, it may take a long time (multiple processors will not help). In general, if you have multiple samples to map, it's better to map them at the same time with separate commands rather than mapping them one at a time with mapping processors. Tophat places several output files in an output directory. The most important is the "accepted_hits.bam" file - this is the alignment file that will be used for future analysis (more info here). There are additional files that can be useful, including a "junctions.bed" file with records all of the splice junctions discovered in the data. Describes which method was used to generate your RNA-seq library. If you used a method that doesn't produce strand specific signal (i.e. just sequencing a cDNA library), then select the fr-unstranded. If you use a stranded method that sequences the first DNA strand made (like a dUTP method), then use fr-firststrnad. If you use direct ligation methods, then fr-secondstrand. Correctly specifying the library type will help Tophat identify splice junctions. In the output format, be sure to select GTF file - the file you download from here should work with tophat. If your goal is to identify novel transcripts and you have several separate experiments, I would recommend pooling all of your data together into a single expeirment/FASTQ file and mapping your data in one run. One of the ways Tophat tries to identify novel junctions is by first identifying "exons" by mapping segments of reads to the genome using bowtie2. The more segments it's able to map, the more confident it is about putative exons and the greater the chance it will identify unannotated splice sites. MethylC-Seq, BS-Seq, or RBBS-Seq data requires a special mapping strategy. In these experiments the genomic DNA is bisulfite treated, causing all unmethylated cytosines to be converted to uracil, which will utimately show up as thymine after sequencing. This is a clever way to figure out which cytosines are methylated in the genome, but requires a clever mapping strategy to avoid bias detection. I'll try to include an example of mapping this type of data in the near future, for now consider this list of BS-aligners. Sometimes it makes more sense to perform de novo assembly instead of mapping reads to a reference genome. Assembly is well beyond the scope of this tutorial.